You start out with three sisters and a bunch of pears. These particular pears were from Mom and Dad's pear tree at the farm. And no we did not spot any partridges. I was kind of disappointed. Anyway, this is our sorry attempt at a "Desperate Housewives" pose. I am on the left discovering that I do not have a "seductive" look in my repertoire. Funny that my sister does and she isn't married. Maybe I used to have one and just forgot how to use it. Sorry Doc! I guess I'll spend some of my spare time practicing in the mirror. Or I would if I had spare time. Anyway, back to canning. It helps to have a designated helper. Lou, Lou was ours. It also helps to have distractions for the slew of other children you might have running wild through the house while you are trying to work. We had various activities including watching the farm cats outside, swinging in the baby swing, and playing nintendo with your cousin watching. You will also need a good peeler. Pear skin happens to be tougher than apple skin (fyi). However, people skin is not tougher than pear skin or apple skin. Be careful with the peeler or you may need first aid like me. You will also need a ginormous canning pot. While you are peeling and peeling and peeling, start some water boiling in this big daddy because it take a long time to boil. After you peel for what may seem like forever, you cook the pears in a syrup made of water and sugar. You also have to boil the lids to the jars (which by the way at this point are being sanitized in the dishwasher). When the pears are done, you fill the jars with them. After you put the fruit in, you fill it the rest of the way with the syrup. Then you put the lids on and screw the rings on and put them in the HOT boiling canning pot. Then you watch and wait and cook the next batch of pears. And repeat for the rest of the day only to realize that you have only gone through about half of the pears. They prove to be VERY handy when you are trying to extract fiery hot jars from boiling hot water. Nifty tools for sure. and the satisfaction of learning a new skill and sore feet. Looks like fun! The next time you guys spend the weekend eating, shopping, and watching movies - - give your dear cousin a call. I completely disagree and was very seduced by your feminine "wiles"! I am so glad we took pics! I LOVED the post. 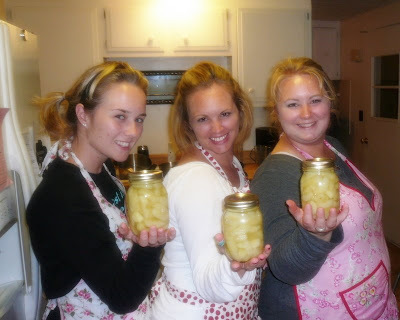 It was so much fun to "put up pears" with you girls. Can you believe we managed to do that with 6 kids underfoot? We rock! Maybe there was a biting incident but it was prety much our only big drama...well there was the dog barking and scaring the children incident. No wonder it took us two days to do this! Can't wait for the great chicken experiment followed closely by the great garden experiment. Oh boy! Grammy and Pop can't wait to eat some of those great looking pears!! You girls DO rock and we'are proud of you! !